Thanks to Sophie, aged 12, who made this great design! 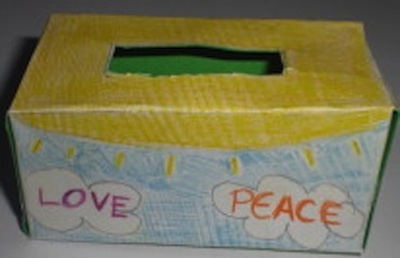 You can make one of these boxes to keep your coins in, to help other children. You will need: scissors and sticky tape, once you have printed the box design. You might also want to use card, so you will need glue too. 1. Click here to download the money box template and then print it. 2. If you are using card, stick the paper with the template on it to the card. 3. Cut out the template. 4. Cut out the black slit (in the middle of the sun). This will be where you can put coins in. 5. Make a fold on each of the four lines going through the sun. Also, make a fold along the top of the grass with flowers. 6. Once you have made the folds, the box should start coming together. Put sticky tape along the touching edges to make the box. Your box should now be ready and you can start collecting coins! Get a grown up to help you donate the coins once you have filled the box.